As adults, brushing our teeth can get a bit boring. We have been doing it for years and it is the same basic routine day in and day out. It can actually be part of the reason for a decline in our oral health as we get older. Is there anything that can be done to combat this? Luckily, the answer is yes. There are a few different things that we can do to ensure that brushing is not mundane and boring each day. The first thing you can do is to change up the type of toothbrush you use. If you are used to using a traditional toothbrush, go electric for a little while. They are only a few dollars more at the drugstore now, so why not? It can be fun, and it can give you a cleaner mouth. Another thing you can do is to try using some of the dental gadgets on the market to floss with. While traditional floss works just fine, there are other flossers that you can use that also work. Consider trying an air flosser or a water flosser to change up your routine. If you want a different type of change, consider getting a fun flavor of toothpaste. You can use mint or bubble gum if you really want, or you can use jasmine, lavender, coffee, cupcake, or pickle flavored toothpaste. Have some fun with it. Maybe get a new flavor for each day of the week and change it up now and again. 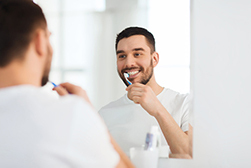 Simple changes in your routine can make brushing more fun for adults, without skimping on taking care of your mouth. Ask us for more ideas on keeping brushing interesting enough to not cost you your oral health.